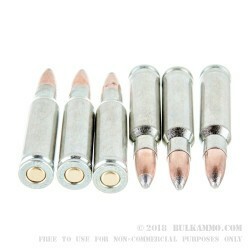 Silver Bear's 308 Win ammo with its soft point projectile is well suited for hunting, target practice, and self-defense. 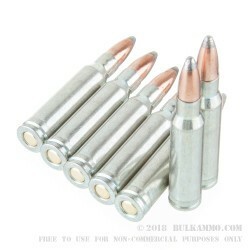 This ammo features zinc-plated steel cases that are berdan primed. Zinc plating is designed to eliminate corrosion increasing the shelf life of your investment and reducing the effects moisture can have on your investment. This ammo is loaded with soft point projectiles designed to expand on impact creating a larger wound cavity to more quickly bring down game. Silver Bear ammo is made at the Barnaul Cartridge Plant which has well over 100 years of experience tracing its roots to the late 1800's. The current factory location has been in production since 1941 and continues to produce quality ammunition for the military and shooters alike. A: This ammo is a steel cased round and the jacket is bi-metal it will attract a magnet despite being the soft point design.